We are very excited to share this recipe with you - it turns a guilty pleasure into a healthy, gluten free favourite! Don't be afraid to get creative with variations of toppings and sauces, and share them with us! Place the cauliflower in the food processor and blend until a flour like consistency is achieved. Place the mixture into a mixing bowl and add brown rice flour or buckwheat flour, soy sauce, lemon juice, salt and herbs. Mix these ingredients and pour in the ice cold water slowly, forming a sticky dough. Line the pizza baking tray with grape seed oil and sprinkle flour. Place the dough and shape accordingly. Bake the dough in 375ºF oven for 20-30 minutes. Once the base is crispy remove from the oven. 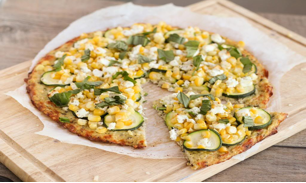 Add zucchini, corn, goat cheese and basil leaves. Bake for 5-10 minutes.